When your needs for classroom space outpace your expansion plans, turn to Innovative Modular Solutions for high-quality, permanent and temporary buildings for education, including mobile classrooms and modular classroom buildings. From single temporary classrooms, all the way to fully designed and prefabricated modular school or campus projects, IMS provides complete solutions for schools, colleges, universities, dormitories, gymnasiums, laboratories, sports and dining facilities. IMS has experience with providing educational modular buildings for public schools, private schools, charter schools, pre-school and daycare facilities, Head Start facilities, and early childhood centers where we created modern, effective environments for nurturing, learning and development. Whatever the educational need – from a portable classroom to complete modular schools –we can provide a total solution, managing the whole project from site development to furnishing. We also provide a wide range of finance, leasing, rental and buy-back options to meet short and long-term requirements. 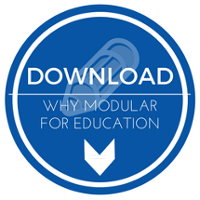 Learn how temporary or permanent modular solutions can be the best answer to get your school the space it needs in our short overview. We have new and used modular classrooms and other portable buildings currently in stock and ready for immediate delivery. Check out our complete list of Available Buildings.